If you flew straight to Antarctica from the U.S., making quick connections and never stopping to rest, the trip would take more than a day and a half. In reality, the trip takes much longer. There are long layovers in airports, weather delays, and a stop in New Zealand to gather cold weather gear and take the first of many safety courses. The team assembled from various points in the U.S. and took several days to arrive in Antarctica. The megadunes research team traveled from the U.S. to Auckland, New Zealand, then to Christchurch, New Zealand. In Christchurch the team received special cold-weather gear and the first of several safety briefings. They stayed for a few days in Christchurch because of weather delays. (Airplane pilots must wait for the weather in Antarctica to be clear enough to land before they can depart.) From New Zealand the team boarded a C-141 Starlifter airplane to Antarctica, landing on an ice runway outside of McMurdo Station. They trained at McMurdo for about eight days, testing and packing their equipment before heading out to the field. 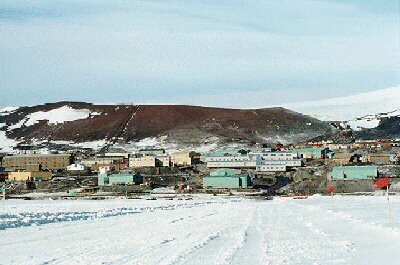 Photo of McMurdo Station. Image courtesy of NSF. When they completed training, team members took a C-130 Hercules airplane like the one shown below to the megadunes camp area. 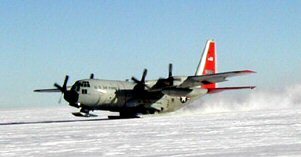 The C-130 was equipped with landing skis for landing on the snow. These aircraft are the mainstay of the U.S. Antarctic program, providing a capability no other country has for moving heavy gear to remote locations. C-130 aircraft equipped with ski landing gear. Image courtesy of Brian Welch, US ITASE.